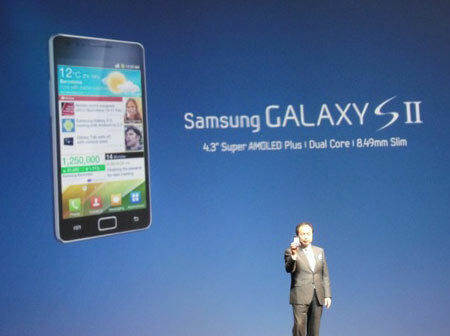 The thinnest smartphone in the world (8.49 mm), Samsung Galaxy S II, is official finally. The handset has been announced today at MWC 2011 in Barcelona. The Samsung Galaxy S II features Android 2.3 Gingerbread and TouchWiz 4.0, includes access to Samsung’s new entertainment hubs, seamlessly integrated to provide instant access to music, games, e-reading and social networking services. It is equipped with a 2MP front facing camera and 8MP camera supporting 1080p full HD recording. However, the most prominent feature lies in its super AMOLED Plus 4.27-inch 800 x 480 screen, the most advanced mobile visual display that provides an extraordinary viewing experience with a wider viewing angle and increased visibility in outdoor. The phone also has a dual-core 1GHz Samsung chip and 1GB of RAM, HSPA+ for speeds up to 21 Mbps, Adobe Flash 10.1 and a 1650 mAh battery. The handset is suggested to be available this month and listed with a price tag of around £549 without contract. Samsung Galaxy S is even better than the iPhone in my eyes, because is having fast OS, great development and perfect display. I have such mobile phone and I’m very proud of it.